Does anyone know of a trick to prevent rodents from nesting in and eating the wiring of a tractor? My father's Zetor was recently ravaged with many wires chewed flush with the back of the control panel. ACtually Scott, I'd be surprised if it was rats doing it, it sounds more like it was squirrels. Theses little critters are built with a particularly strange set of habits, amongst the forefront is a need for a balanced diet, seriously! A rat will happily live on absolutely anything, a squirrel will however, go a little 'squirelly' (pun intended) if their body senses that they need more of something in their diet (it is this same 'programming' that makes dogs eat grass, and deer lick salt from the gravel next to roads). The little fellers eat your wiring because their instincts tell them too. instead of trying to fit Mother Nature, do her a favour, put out a 'Mineralized Salt Block' like what cows need, a short distance away in a sheltered location and they will attack it rather than your prized possessions. Besides, boosting wild animal health is one of the best defences against things like Mange and Rabies. Best of luck. 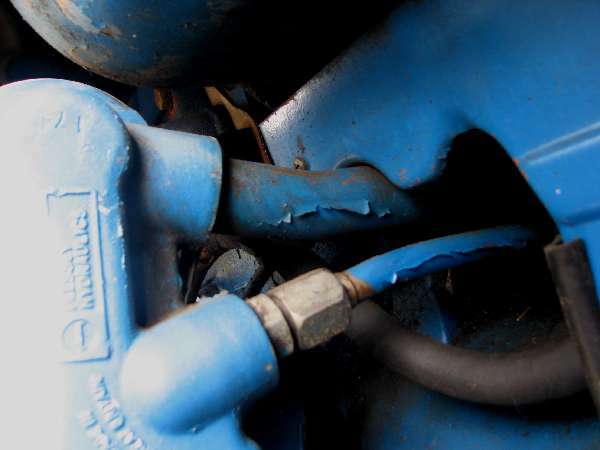 I have had the same experience with mice nesting in amongst the wires (and eating the wires) of different sized tractors and autos, when parked outside or in a open shed. Never had any problems with squirrels though. The nests the mice make are very smelly, and I believe that they come back to that smell (just cleaning out the nest doesn't discourage them from returning). I discovered that spraying the area with bleach (I did this because when re-wiring the tractor, I couldn't stand the mouse urine smell) did have an effect on the re-building of the nest. You can tell if you have rats versus mice by the size of the turds left behind. Mice are about the size of grains of rice, rats the size of navy beans. Sorry if that comparison causes a loss of appetite for anyone. I'm not sure how sealed the console of the tractor is. If the only access points are fairly small, stuffing them with steel wool will keep mice and probably other rodents out. At least steel wool seemed to stop the mouse invasion of the construction trailer at our camp. Wire screen may work for larger spaces. All rodents have to chew to keep their teeth from growing too long. They'll chew most anything available. Maybe the wiring was just something there, and covering wiring harnesses with the tubing sold to protect trailer wiring would provide something to occupy them. It's a different problem if they're attracted to something in the insulation. We're in the middle of a mouse plague year here, and they're everywhere. It doesn't seem how much bait or traps are used, there are always more mice in a couple of days—but fortunately not in our house. The chipmunks and squirrels that have tried nesting in our car and truck haven't chewed wiring but they have left places stuffed with pine needles. I think I'd concentrate on making the console less attractive for rodent digs. Owls etc. and people can’t seem to kill enough mice to make a dint in the population this year. I had a problem with mice in my riding mower. The nests would block airflow, it would overheat moderately and spit a valve seat. Moth balls worked for me. I just left the whole box sitting on the mower, around the engine, and moved it before I mowed again. I would caution that I don't know how flammable they are; forgetting to move them could be dangerous. The mice once pretty much ruined the wiring to the rear end of a motorcycle that I kept in the shop. Had to re-wire the turn signals, brake and tail lights. They chewed on the plastic airbox cover, too. After that, it was war. I control population with D-Con, and discourage nesting with moth balls. Around the Rocky Mountain area what you describe would be due to pack rats doing the damage. They have a thing for wiring and often will rob all the wires that run anywhere close to their nests. Instead of just clipping the wire, they will cut it at the firewall and then follow it forward to where it disappears in the front and clip it there as well. Then they must take it somewhere because it is not in their nest...it is just completely missing. They can built a nest overnight and fill up the hood of your car with twigs and dry leaves in a week. The common trick here to keep them from nesting under the hood of a car is to prop the hood open. They don't seem to like it nearly so well when the hood is open. In the past I've had mice/rats ruin the woring harness and also chew thru the radiator hoses on my combine. After a sort of pricey repair I would dump a couple boxes of moth balls around in the engine compartment and under the cab where lots of wiring and hydraulic hoses are. That seemed to work for me. On another occasion we had bought a new travel trailer but didn't have a shed to winter it in and never had a mouse problem so long as it sat outside. After a couple years we put up a shed to store the trailer, then the mice moved in. A campground owner told me afterwards that anytime an RV is stored inside for the winter the rodents will move in, but they seldom bother if the unit is left outside. OK, he was right after that we left it outside and no rodents, so go figure.